Our school kids programs, located in both our Phoenix and Scottsdale locations, are dedicated to the successful development of your child. We are absolutely committed to helping your child to develop to their full potential. With a facility full of educational resources for all ages and a staff of highly trained educators, we are proud to state that our program is unsurpassed by other “big chain” programs of the same nature. while still being able to provide a fun learning center environment for everyone. We provide nutritious meals for the children in all of our programs, including breakfast, snacks, and dinner based on the schedule that your children are with us. Our goal is to help provide your child with nutritious and locally sourced foods that will help them maintain focus and energy throughout the school day. Our staff understands that keeping up with a child’s nutritious diet will also improve their mood and their overall behavior as well. This is just another way that we want to do everything that we can to help your child succeed. This program is dedicated to the safety and care of your children while aiming to provide more personal and one-on-one attention to each of the children in our care. We are a mid-sized program, which allows us to keep the classroom and program sizes to a level where this is possible, and our staff is able to better guide and help your children. We also have some amazing programs coming up for the weekends and we always have a summer camp for your children as well. WhizKidz school kids program/after school program is open from 6:00 am – 6:30 pm, for pre-k to 4 (and older if special accommodations need to be made), making it convenient for you no matter what your hectic schedule is. 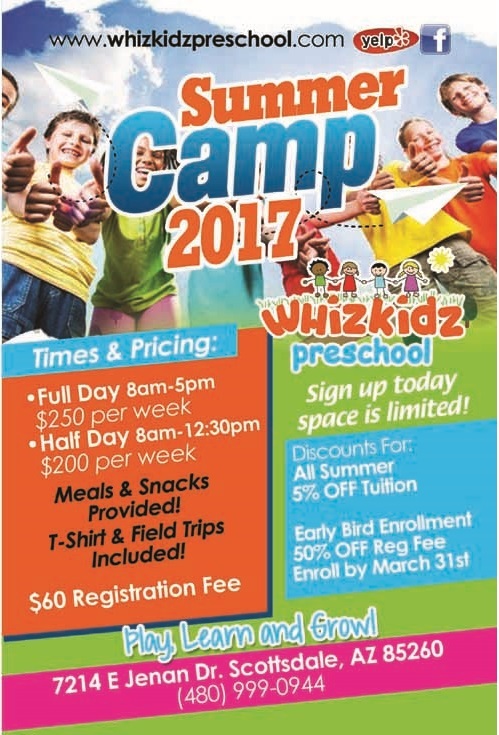 With several enrollment plans and affordable prices, we make choosing WhizKidz Preschool your best choice when choosing an after-school program or daytime program for your children. Coming Up – Summer Camp 2017. You don’t want to miss our Summer Camp for 2017! 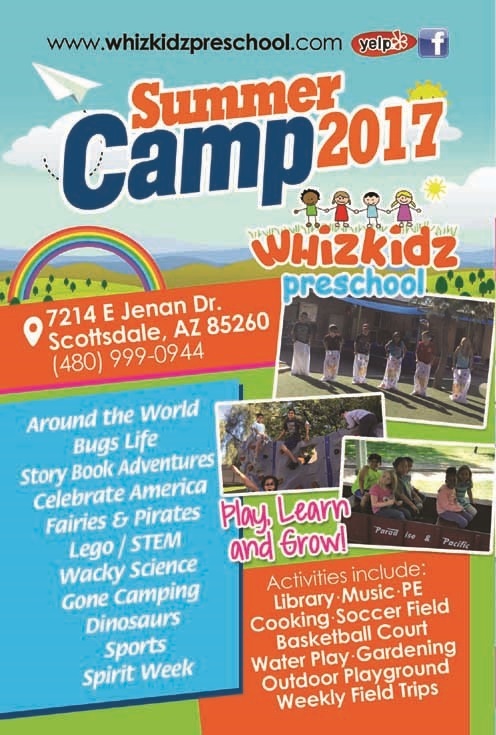 For questions about our school kids program or to come and visit our educational facilities email us or call us now at (602) 971-7007. We look forward to becoming an integral part of your child’s development.